When you've got a shiny new 4K TV in your living room, you're going to need a lovely super-powered console to go with it. 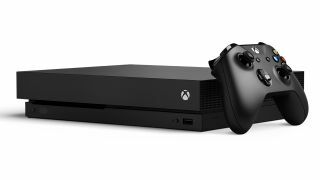 And what better than the Xbox One X; a brand new console that packs enough tech to play all your games in stunning 4K resolutions. Gorgeous. Argos has even made the whole thing a lot, lot sweeter, by chucking in three games for free when you buy an Xbox One X right now. For the traditional £449 RRP, you also get Assassin's Creed Origins, the Game of Year edition of Overwatch and FIFA 18. That's more gaming content than one person needs in one go, but never ever look a gift horse in the mouth. Xbox One X with Overwatch Game of the Year Edition, FIFA 18 and Assassin's Creed Origins for £449.99 (RRP console only £449) Three games and a brand new console for the price of the console alone, you say? And three utterly brilliant games too? SOLD. Of course, once you've started your 4K gaming adventure, you might want to check out the deals on our pick of the best gaming surround sound systems, and then work your way through our list of all every Xbox One X enhanced game. You absolutely need an Xbox One X in time for Sea of Thieves anyway right? At least that's what you can tell your wallet.